Favoring a landscaped reappropriation for the space extending the park of Versailles instead of unrestricted construction. Upon  reading the two articles in La Tribune de l’Art (see here, in French, and here), it would seem that a certain number of legal points have not been taken into consideration. We find it useful to provide a few more enlightening remarks which will help readers to better understand the subject. A higher standard imposes itself here for the PLU : the SDRIF (le schéma directeur de la Région Ile de France) [Guiding scheme for the Ile de France region]. The orientations and instructions of the Guiding Scheme are imposed to make them compatible with the local zoning documents such as the PLU. The SDRIF project for 2008 confirms the orientations and assigned ground areas for the three sectors involved, Pion, Satory and Matelots-Mortemets. Until the new Guiding Scheme is approved, the 1994 document applies. According to the SDRIF, Satory and Pion are classified as "urbanized spaces" and "spaces which can be urbanized", those of Matelots and Mortemets are "urbanized spaces". Any discussion seeking to classify these spaces as natural zones, which cannot be urbanized, is thus pointless. The only possibility available to the City of Versailles for preserving the future of these spaces is to obtain a restriction freezing construction for a limited time period (with a legal maximum delay of 5 years). A period of reflection and study should be imposed in order to favor unified quality projects whose landscape and architecture are coherent with the natural lay of the land and the exceptional buildings which constitute the identity of Versailles. This is what is proposed in the current PLU. 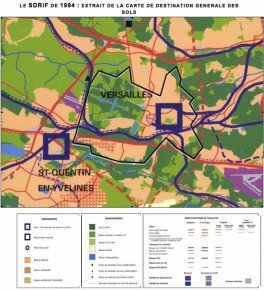 Given the legal constraints imposed on the City of Versailles in the revised PLU, the only possibility open to the City is to oppose the "mitage" or unrestricted building, random and disorderly construction and any form of construction which does not take into consideration a unified logical approach. This logical approach and this method should be based on the city’s zoning strategy, founded on a determination to integrate any new project in the pursuit of excellence of its architectural achievements bequeathed to it historically while at the same time enhancing the exceptional natural heritage which makes up the uniqueness of Versailles’ urban layout. Seen in this light, this is an endeavor to strengthen the historical and landscaping unity and complementary nature of the city - château - park of Versailles which constitute its inseparable urban and landscaped character. Means of expression such as creating an email address intended only for receiving observations concerning the revision of the project and a postal address. The exchanges and debates which took place in the course of the public meetings were constructive, they did not reflect any disagreement on the proposed orientations and helped to better define, complete and share the approved orientations of the revised PLU project. The project for partial revision was approved by the Municipal Council on 27 January 2011. This project was transmitted to the related public bodies : the government, region, department, consular chambers, but also the EPV... providing them with the possibility of stating an opinion within a three month delay. The file for the partial revision of the PLU, accompanied by the opinions of the public bodies, was submitted to public inquiry from 17 May 2011 to 22 June 2011. An exhibition presented the contents of the revision project. Opening hours were available four times during this period. The only changes added to the file for the partial revision of the PLU resulted from the study of the opinions expressed by the public bodies as well as from the report of the Inquiring commissioner. An updating of the PLU was needed as regards the decisions made after the approval of the PLU concerning the Grand Paris project. According to the orientations and measures of the SDRIF, the Pion sector is partly an "urbanized space" and partly a "space which can be urbanized". The City wishes to make the Pion site a space which combines the preservation of a green frame and the installation of a quality urban site extending the continuity of the Etoile Royale perspective. As a reminder, it would be useful to point out that since 1984, the Pion site was classified a zone UI, intended essentially for welcoming industrial activities. A new zoning rule was established in the 2011 PLU for the site, called zone UR. This states the construction conditions regarding the application of the exposition plans for the noise coming from the airfield at Saint Cyr and the desired environmental and architectural demands for this site. According to the orientations and measures of the SDRIF, the Pion sector is partly "urbanized space" and partly "space which can be urbanized". Zone AU, located on the site of Satory-Ouest corresponding to the "maneuvers field", applies to spaces of natural character of the city designated for future building in either a short-term or long-term delay and conforming to the SDRIF orientations which identify this zone as a zone which can be built up. It would be helpful to point out that the classification as a future building zone has existed since the 1998 POS. The City wishes to carry out a quality global project in Satory while preserving a strong landscaping and architectural unity. In order to maintain control of the overall perimeters and thus guarantee the global quality of the installations, the city has stipulated in its 2011 PLU north of the chestnut lane a restricted perimeter freezing construction. The Guiding Scheme identifies these two sites as "urbanized spaces". The orientations for installation elaborated in the revised PLU should therefore be compatible with the intended use for the ground areas defined by the Guiding Scheme. The PLU for the City of Versailles formulates evolution proposals which are very respectful of the historical, natural and landscaped capital if the Domaine national de Versailles. Within the Matelots-Mortemets sector, the orientations for installation were established in order to define the intended use for each of the sectors making up the site, the principles of urban composition and its access. For Mortemets, this sector will become a landscaped space linked to the composition of the château park and the Suisses pond. It will thus be able to welcome activities related to this landscaped plan, including family gardens and installations welcoming the public. While awaiting the planned relandscaping of the site, set out by the EPV in the communications presentation  and in its decision concerning the PLU project, the activities already implanted there can continue. The installations needed can be built as long as they do not change the views from the château and do not compromise the future landscaping of the site. The classification as a zone NP of this sector is justified by the wish to preserve the ecological quality of the environment and the exceptional historical interest of the site which makes up the Domaine national de Versailles. For Matelots, the entire site, except for that intended for military activities, is limited by a restricted building perimeter while awaiting a unified project of installations. However, the sector in which the army maintains active installations does not fall within the restricted perimeter. Until these projects are specifically defined, it appeared necessary to preserve the future of the site in order to allow for coherent and balanced installations on the whole site. This restriction freezing construction is meant to stop the evolution of a sector which will eventually undergo extensive urban changes and for which the city does not have specific plans. The purpose of the installations in this sector is therefore to achieve a balance between a new plan in better agreement to the park of the château while benefitting from its excellent location. The restoration of the Grande Allée in Mortemets, between the Suisses pond and the west end of the Matelots camp is a major priority for the City. Both municipalities, Versailles Grand Parc and the City of Versailles preferred the landscaped reappropriation of the "allée royale", a first step in restoring the site as suggested by the recent proposal of creating a vegetation barrier to hide the very deteriorated site of Mortemets. This lane will be open to the public and will become the star attraction of a structural artery of the Schéma Directeur des Circulations Douces de Versailles Grand Parc [Guiding Scheme for Low Impact Circulation in Versailles Grand Parc], connecting the royal lane in Villepreux to the Bièvre valley. This lane, entrusted to Pierre-André Lablaude, chief architect for Historical monuments in charge of the gardens at the Château de Versailles, will be for the recreational use of cyclists, hikers and perhaps horseback riding. This project received the full-hearted support of the Etablissement public du Château de Versailles (as per the opinions expressed during the revision of the PLU), of the Agence des Espaces Verts de la Région Ile-de-France and of the Conseil Général des Yvelines, who have agreed to contribute to the funding. The mayor of Versailles also obtained the support of the French Minister of Defense authorizing the crossing of the land at Matelots, which it manages. This is a first step reflecting the City’s intention to enhance the value of the natural spaces of a site which today is left to unrestricted construction. "le porter à connaissance" in French.